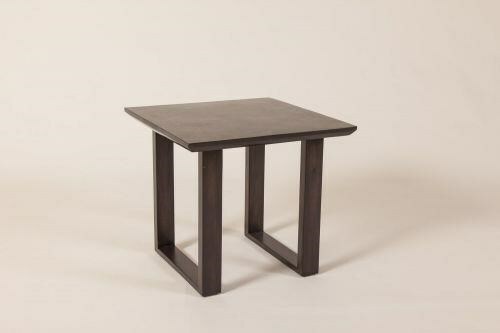 Perfect for a smaller space, this end table features clean lines and a modern silhouette. Sleigh legs give the table an airy and open design, while a black mactan stone top keeps the look polished and luxurious. The Loft End Table with Stone Top by C.S. Wo & Sons at C. S. Wo & Sons Hawaii in the Hawaii, Honolulu, Oahu, Hawaiian Islands, Waikiki, Diamond Head, East Honolulu area. Product availability may vary. Contact us for the most current availability on this product. Clean lines meet tropical materials for the uniquely modern and refreshingly laid-back Loft collection. Contemporary silhouettes are defined be sleek lines and sleigh legs that give each piece a light and airy feel. Crushed bamboo drawer fronts on select pieces provide a rustic tropical allure, while a Smoke finish ties the whole look together. Highlight your love of sophisticated simplicity with the beautifully balanced and effortlessly chic Loft bedroom and dining collection. The Loft collection is a great option if you are looking for Contemporary furniture in the Hawaii, Honolulu, Oahu, Hawaiian Islands, Waikiki, Diamond Head, East Honolulu area. Browse other items in the Loft collection from C. S. Wo & Sons Hawaii in the Hawaii, Honolulu, Oahu, Hawaiian Islands, Waikiki, Diamond Head, East Honolulu area.